Sprinkle both sides of fish fillets with taco seasoning mix. Heat oil in 12-inch skillet until hot. Cook fish in oil 6 to 8 minutes over medium heat, turning once, until fish flakes easily with fork. Cut into bite-size chunks. Meanwhile, heat taco shells as directed on box. In large bowl, mix yogurt, lime peel, lime juice, sugar and salt. Stir in coleslaw mix, cilantro and jalapeño. Let stand 5 minutes. 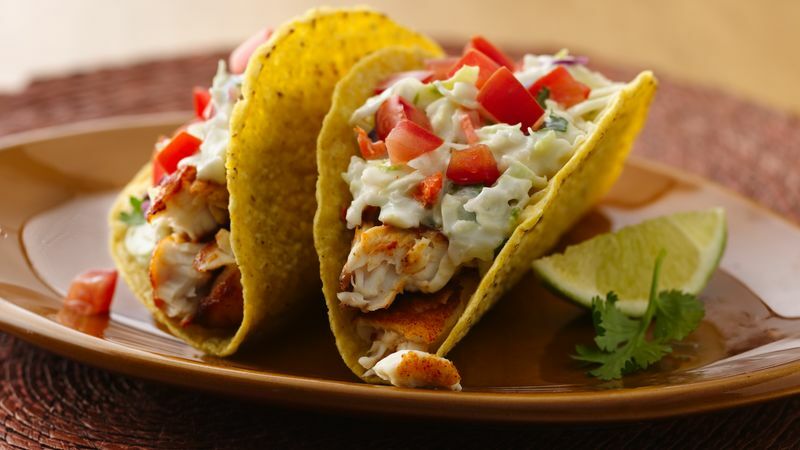 Spoon slightly less than 1/4 cup fish chunks and 1/4 cup coleslaw mixture into each taco shell; top each with about 1 tablespoon tomato. When chopping the jalapeño chile, wear gloves to prevent skin irritation from the oils. You can omit the jalapeño if you have kids that don’t want their tacos so spicy.